I've known about this book for months now, but my obsession went a bit over the top when Nikki over at There Were Books Involved... wrote her review on the book (which you can and should read because nothing I say can beat it - click here to read it). A while back I started following the author, Victoria Schwab on Twitter, and she is literally the most amazing, fun-loving person I have ever met. And of course, all of this only served to further my excitement THAT MUCH MORE for the novel. I don't even understand how I survived the wait. And then the day the book was released, A Darker Shade of Magic, or ADSOM, was out of stock at the nearest Barnes & Noble before I even woke up! I was a bit miffed. Luckily, my guardian angel of a mother got me the novel the next day after work, and every day since has been a delight to behold. You'd think that for a book I love so much, it would be easy to write a review, but it's actually quite the opposite. I've read several different reviews of the novel, and while they all perfectly emphasize how amazing it is, none of the ones I have read have actually been able to explain the plot. I'll tell you in advance that I shall fail at it as well - it's too good to be summarized - but hopefully what I do say remains coherent. There are so many things I love about this book, it's impossible to try and pick out which parts specifically I liked. But I shall try. Whenever I think back on this book or I go to tell someone how breathtaking the novel was, I always go back to the words. I don't know what it was about them, but they flow so perfectly together that everything automatically becomes beautiful. I don't understand it, but I pretty much read each sentence twice while reading the novel. In fact, I have only a thousand red post-its in the novel marking my favorite parts. Which is basically all of them. I had this little fiasco where I ran out of post-its and had to put my ADSOM reading on pause; I almost died. I know for a fact that the gorgeous wording is not the best thing about the novel, but that doesn't mean it can't be appreciated, right? It really helped to add the magical-ness of the reading experience. ADSOM is on a pedestal so high right now I can't even see it. My absolute favorite aspect of ADSOM is undoubtedly the characters. There was so much depth to each and every one of them, and within just a few sentences, Schwab had me invested. Kell, Rhy, and Lila are the best characters I may have ever encountered in my entire existence. Kell, I loved for his loyalty to the people he met, for his childlike love of things non-magical, and because heck, he's Kell. And then of course there's his multi-sided coat. Can someone please make and sell one of those?? Delilah (Lila) Bard was the other main character, and I loved her simply for the fact that she was a cross-dressing pickpocket who had aspirations of becoming a pirate. She is literally me. Of course, where we differ is that Lila is forever on the lookout for adventure, not afraid of death, and so loyal she doesn't even know it. Rhy, Kell's brother, of a sort, was the most unique prince ever, if you ignore the fact that he is the total package, aka a charming rogue. Where Rhy comes off as unique is that he has the kindest hard of all the characters. I can't wait to see the developing relationship between him, Kell, and Lila in ADSOM2. The end of the book left me hollow and in shock, and the second book cannot come fast enough. I have very high hopes for that thing. I said the characters were my favorite part, but the setting(s) are a close second. Red London, Grey London, White London, and Black London. Wow. I don't know how Schwab came up with those, but they are bloody brilliant. 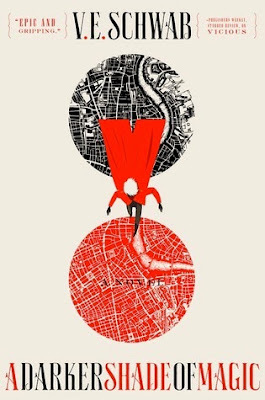 Red London is home - to Kell at least - Grey London is the non-magical London, Black London was so powerful it destroyed itself, and White London...scares the heck out of me. Four brilliant settings, and each one feels so real. I'd like to focus on White London though, because the glimpses into that city were the best, if the most frightening. White London is a city of bloodshed, violence, and pure malice. And the two rulers of the city, Athos and Astrid, are the two most evil villains you may ever encounter in a book. I'm not kidding, it's entirely possible. Those siblings are the gorgeous, sadistic people who live in nightmares, and boy has Schwab brought them to life. If there was one reason to be gripped by this book, it's them, THOUGH ALL PARTS OF THIS BOOK ARE AMAZING. If there was one thing that I could have wished for, it would be a tiny bit more romance. Don't get me wrong, this book would have been blindingly beautiful even if there wasn't a hint of romance - which there was - but I would have liked for there to be just a teeny bit more. Truthfully, however, ADSOM is perfect just the way it is. The hints of romance between two people and the bit of flirting involving another character at the end of the novel have me freaking excited for the next book. Gawd, I can't wait. IT WAS SO GOOD, GUYS. There is literally no one in the world I would not recommend this book to. It's an Adult novel, but it's so much like a Young Adult book you really can't even tell the difference. And for fans of the Adult genre, there's that maturity that some YA books find lacking. Really, you can't go wrong with picking up this book. Book Synopsis: Kell is one of the last Travelers—rare magicians who choose a parallel universe to visit. Source: Bought the book from Barnes & Noble as soon as I could (and you should too)!